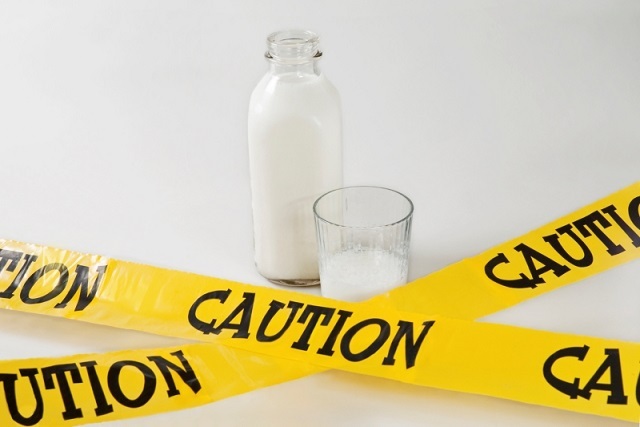 Lactose intolerance is more common than you might think. It affects more than 75% of people around the world. Found in milk and dairy products, lactose is a sugar that some people cannot digest. You develop lactose intolerance when your small intestine does not produce an enzyme called lactase, without which it is not possible to digest lactose. You may end up developing several lactose intolerance symptoms when your body fails to produce enough lactase and you have food in your diet that contains lactose. Let's find out more about those symptoms. Depending on the amount of lactase present in your body, your symptoms may be mild or severe. You usually experience symptoms within the first 30 minutes of eating milk products – some people may experience symptoms after 2 hours of eating products that contain lactose. Some of the most common symptoms are gas, bloating, rumbling sounds in the belly, cramps or pain in the lower abdomen, vomiting, and loose stools. Newborns can also be lactose-intolerant, and they may have symptoms such as diaper rash, foamy diarrhea, dehydration, vomiting, slow weight gain, irritability, and weakness. As you can see that these symptoms are quite common and may indicate another issue, but most people think they have lactose intolerance because they experienced these symptoms after drinking a glass of milk. If you experience these symptoms once in a while, you are not lactose intolerant. You have this condition if you feel sick every time you have ice cream, milk, or any other dairy product. Also, keep in mind that it is possible to develop lactose intolerance suddenly. However, most people experience these symptoms during their adult years. You will keep experiencing these symptoms until your small intestine starts making lactase. What to Do If You Are Lactose Intolerant? Once you know you have lactose intolerance, you have to be very careful with your diet. It is important to pay attention to how your body reacts to different foods containing lactose. Some people have severe lactose intolerance, so they have to eliminate milk products from their diet. Others may not experience severe lactose intolerance symptoms and they can manage things with lifestyle changes. Here is what you can do when you have lactose intolerance. Even when you have lactose intolerance, you may still be able to enjoy certain milk products. You should gradually introduce milk products into your diet while keeping an eye on how your body reacts. Overtime, this helps build some tolerance to those foods. Pay Attention to Your Serving Size: Limit your serving size of dairy products. Do not sip more than 4 ounces of milk at a time to avoid any gastrointestinal problems. Combine Milk with Other Foods: Drink milk when eating other foods. This helps slow down the digestive process and lowers your risk of developing lactose intolerance symptoms. Experiment with Dairy Products: Try different dairy products. Some dairy products such as Cheddar, Swiss and other hard cheeses do not have high amounts of lactose, so you can eat them safely. You may also be able to enjoy cultured milk products without having to deal with any symptoms. Opt for lactose-free products. You can now find many brands offering lactose-free or lactose-reduced products. Try them to avoid your symptoms. Take lactase enzyme drops or tablets. This is another way to eat dairy products when you are lactose intolerant. Calcium is an important mineral and helps improve your cardiovascular health. It also plays a role in weight management and lowers risk of colon and rectal cancer. You can get calcium from yogurt, raw milk, raw cheese, cooked kale, broccoli, and sardines. Without enough vitamin K, your body cannot absorb calcium. Vitamin K is also important for your metabolism, brain function, and hormonal balance. You may be vitamin K deficient when you are lactose intolerant, so it is important to eat green leafy veggies, Brussels sprouts, scallions, cucumbers, cabbage, and dried basil. Bone broth can help heal the gut and prevent lactose intolerance symptoms. It also helps your body overcome food sensitivities, intolerances, and allergies. It also boosts your immune system, improves joint health, and reduces cellulite. Organic free-range chicken and grass-fed beef bones are great options because they provide you with magnesium, calcium, sulfur, phosphorus, and other minerals. The presence of natural gelatin and collagen is another reason why bone broth may help to ease food sensitivities and allergies. Increasing the number of good bacteria in your gut is a surefire way of improving the health of your digestive system, which in turn will prevent symptoms of lactose intolerance. Probiotics can help improve nutrient absorption, support weight loss, and strengthen your immune system. You can opt for non-dairy foods with probiotics, such as Kimchi and sauerkraut that are made using fermented cabbage and other veggies. You can also opt for fermented beverages, such as kombucha and Kvass, which are beneficial for liver detoxification. Coconut kefir is another good option. Your body can convert coconut oil into energy with ease, and that is the reason why you should start cooking in coconut oil from today. Not only does it help with lactose intolerance, it also improves digestion, burns fat, balances blood sugar, and kills bad bacteria. You can even use coconut oil in place of dairy in tea and coffee. Can You Lie Down Immediately After You Eat? Is Making Yourself Throw Up Bad?